All thirty nine courses taught in the first year of study at Charis Bible College's Colorado campus have been recorded live. Now you can experience the great teachings of Andrew Wommack, Wendell Parr, Barry Bennett, Arthur Meintjes, Bob Yandian and more, in the comfort of your home! Order the complete program by term, or individual course. Buy the full correspondence course on CD, DVD or USB today! Includes Term 1, Term 2 and Term 3 - With powerful grace speakers such as Andrew Wommack, Wendell Parr, and Lawson Perdue expounding the truths of the Bible you'll be coming back to these teachings again and again. 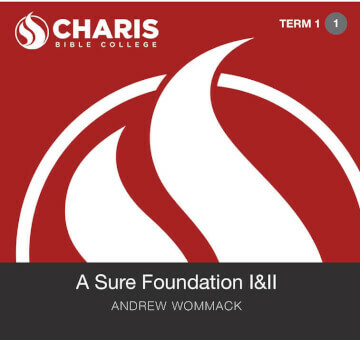 Or buy a Term at a time..
Get the whole first term of the Correspondence Course and listen to Andrew Wommack and Barry Bennett’s teachings on the foundations of Righteousness, Discipleship Evangelism, and much more. All available in CD, DVD and USB formats. Work at your own pace to complete the second term of the course and explore your relationship with God and discover a lifestyle of worship with teachers Wendell Parr and Andrew Wommack. All available in CD, DVD and USB formats. This package contains all of Term 3 teaching sessions, where Andrew Wommack, Greg Mohr, Barry Bennet, and more cover Excellence in Ministry, Receiving from God, and further insights into the Old Testament. All available in CD, DVD and USB formats.